They used to give them away, and they always smelled like old pickles. Some people used them like adult EZ Steppers when things got a little crazy around New Years Eve. Around 3 AM, I’m thinking. Somewhere, somehow, some old geezer (and I am probably called an old geezer, nowadays), thought it might be a neat idea to take one of those and use it as a seat when ice fishing. And why not? It was just about the perfect height, it held all your ice fishing equipment, it held up under the cold weather, and it smelled like old pickles! 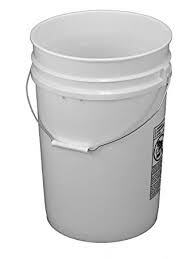 So some smart guy, likely the guy who was the second best salesman of ice to Eskimos, decided he would take those old 5 gallon buckets that were left secretly at the curb every night for the trash man by wives (who hated pickles) and try to sell them as “deluxe ice fishing seats”. Now, I’m not sure how big his market was, but apparently it was big enough that Pringles held a secret meeting with some farmers who were covertly involved with the company that was the precursor to Monsanto and THEY had hoped for some monster sized potatoes. Yes, there were a few bruised egos, but now that Monsanto had their OWN ‘new idea’…well, they ran in a different direction: Genetically modified monster-sized cucumbers. Still, there were some at that meeting that stayed behind and believed in the NEW 6 gallon bucket. Somehow, and this is just legend, they got a hold of that ice-cube-salesman-turned-5-gallon-bucket-salesman. “Dave” was quite gracious they considered him because he was really tired of the pickle smell and the consequences of that smell at the local watering hole. Anyway, they granted him rights to sell the new 6 gallon bucket. 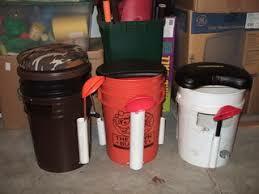 Well, you know the rest of the story…the 6 gallon buckets are everywhere now…and around $5 bucks a pop. They don’t even smell like pickles. Well, that’s the history of the 5 gallon bucket turned to the 6 gallon bucket. “Dave” retired, of all places, in the Bahamas, and who wouldn’t? 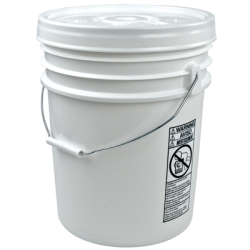 So, you got your 5 or 6 gallon bucket to sit on…now what? Well, is it comfortable? Doubtful. You need a cushion of some sort. While the cushion is nice, do you REALLY need to unload everything and turn the bucket upside down? What if…what if you could hang some sort of a belt around the outside of the bucket, and have some sort of a cushion without having to unload everything? And what if the cushion could also hold stuff? You have that mental image! Me too…about 10 years too late though. So you need to make this work for ice fishing, right? 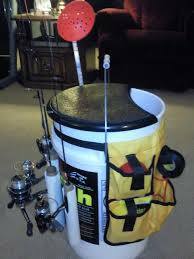 Nearly $90.00 for a six gallon bucket and some accessories? Well, if you have the cash, why not? I don’t recommend using old cat litter buckets, because every fish knows that cats eat fish. You can’t even catch catfish using an old cat litter bucket. I know what you are thinking, and I’ll put that idea to rest, because you are wrong. An old 6 gallon bucket that used to hold fresh Sushi DOES sound like a good idea, doesn’t it? Well…here is the problem…they don’t MAKE 6 gallon buckets of ‘fresh’ sushi. It kind of defeats the purpose.